At myBooks, we go the extra mile to protect the business information of our customers. We’ve put in place multi-layer security systems that are regularly tested for breach and upgraded on schedule. We pride in our small business accounting software as being reliable and secure. As a data-oriented company, the security of data is a priority. Which is why we are always ahead of our competitors in terms of security policies, technologies, and application. myBooks adopts a 6 prong approach to ensuring your business data is secure, safe and retrievable when you need it. The security of our product is seen as the lifeline of our business, and every of our employees are trained to handle customer data without a breach through advanced security tools. myBooks utilizes advanced industry standard encryption protocol and medium in the transmitting of all your data. With Encryption at rest, there can never be any form of data breach. Any data on our servers cannot be decrypted by any other persons or group except you. We believe firewalls or anti-virus is not enough, an additional layer of defense need to be added to protect your data. From the cloud to the browser you are using to access your data, myBooks ensures your data is fully encrypted. 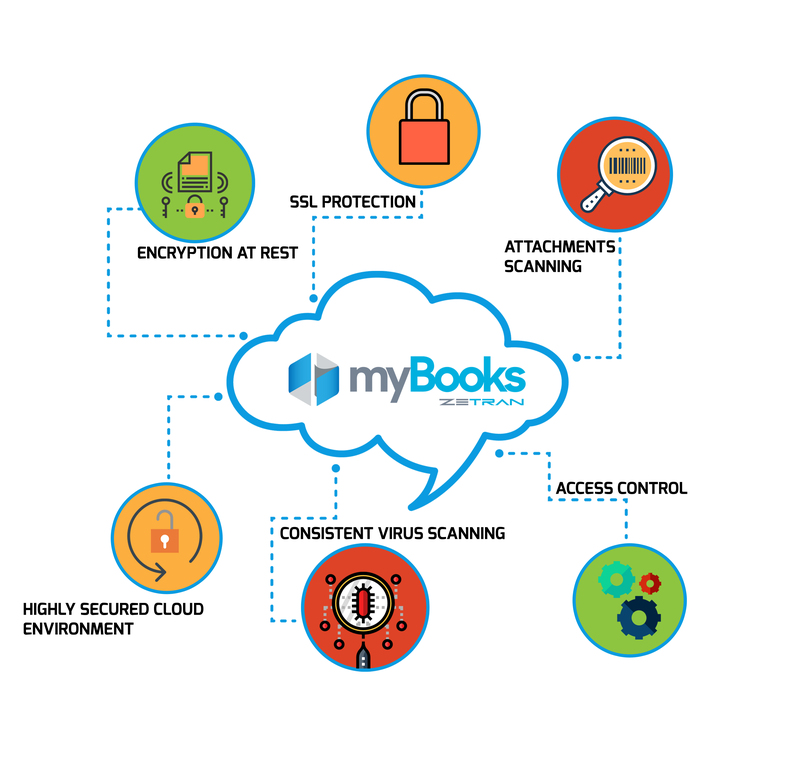 myBooks relies on SSL Protocol to protect every of your information submitted in the process of accessing your data. Every of your confidential information such as passwords, login details or your customer's information is heavily guarded. myBooks cannot put anything to chance which is why we run an extraordinarily secured platform. myBooks implements a security protocol that that does not give room for any vulnerabilities. Our cloud network is fully gated to prevent any form of intrusion via attachment. Every attachment uploaded are subjected to thorough scrutiny to ensure there is no compromise that can affect your data or that of others. At mybooks, every access into our systems is monitored, controlled and audited. As a customer, you are allowed to give access to multiple users but what and where they have access to is determined by you. None of our employees can have any access to your information except you ask for help. Accessing customer information is allowed on an as-needed basis only and every of the process is closely monitored. Our cloud network as an online accounting software scans every traffic coming in and going out for intrusion or breaches. We employ advanced virus scanning protocols that are regularly updated to handle new malware. myBooks combine multiple anti-virus protocols to look out trojans, monitor behaviors and check files integrity. myBooks designed our cloud environment with a disciplined approach to processes and interaction. For your data, it’s an end to end for the highest level of data protection. myBooks cloud computing infrastructure utilizes a backup system and it is tested based on a schedule for leakages and vulnerability.